For millions of people around the world, stress is a silent problem impacting their health, happiness, and daily routine. The 2015 Stress in America study showed that stress levels of Americans continue to rise year over year. Not surprisingly, adults reported that stress has a negative impact on both their mental and physical health. And most feel they’re not doing enough to manage their stress. The problem here is not just the number of people suffering, but the confusing and often contradictory suggestions to navigating stress management options. Commonly discussed stress relief methods range from counseling and mediation to exercise and diet changes. But one of the most effective yet enjoyable ways to reduce stress is with the often overlooked concept of hydrotherapy. The mission in this post is to recognize what stress is and its impact on our health, then breakdown the essence of hydrotherapy and techniques that have proven to alleviate both situational and longer-term chronic stress. Before you make a plan to deal with your stress, it’s important to understand what it is exactly. Up until the last few decades, not much was known about stress as a health condition. The idea of stress wasn’t even talked about in the medical community until a physics researcher in the early 20th century, Hans Selye, coined the term to describe the physical and mental strain more and more people seemed to be experiencing. Today, stress is defined as a feeling of tension as a result of outside circumstances. Stress can be caused by a number of outside forces and life circumstances. Common situational stressors include the death of a loved one, loss of a job, a divorce, an injury, or a big move. Chronic stress can commonly be a result of workplace issues, anxiety-related conditions, or even just pessimistic personalities. Though considered an entirely normal reaction in some situations, stress can too often be devastating to the body and one’s overall happiness. The most common symptoms people feel when more stressed out than usual include headaches, insomnia, fatigue, moodiness, problems concentrating, and stomach issues. For short-term stressful situations, these symptoms may come and go. As the feeling of stress dissipates, the person may start to feel better and back to normal. Chronic untreated stress, however, causes more havoc on the body, including episodes of depression, anxiety, weight changes, high blood pressure, skin problems, and cardiovascular concerns. Instead of ignoring stress, a better plan is to confront it and look for ways to feel better. Not only will you feel more like yourself when you address your stress, but you may also see significant improvements in your overall wellness. Regular stress relief can help you feel more vibrant and energetic. Being relaxed can also improve heart health and high blood pressure. Stress relief has also been shown to boost the body’s immune system and lower the risk for getting a cold. One of the most popular vessels to use for stress relief is water. For thousands of years, humans have been fascinated by the water in the world. Fresh water is an essential need for anyone’s survival, and the search for clean drinking water has been a chronic struggle for most societies up until recent times. Water as a healing source has also been an important part of ancient medicine. The use of holy water in spirituality, natural hot springs for wellness and calming ocean water for vitality has been part of history for centuries. Water in all of its forms, such as liquid, steam or ice, continues to be a therapeutic method of helping people feel better during stressful times in life. Hydrotherapy is a popular and effective way to help people ease life’s stressors. Research has shown a link between starting hydrotherapy and seeing a decrease in a person’s depression or anxiety levels. The idea of hydrotherapy originated in the 19th century with Sebastian Kneipp’s water therapy practices designed to rid the body of toxins. Now, different types of hydrotherapy are widely used to treat many different medical ailments or chronic issues, such as stress. A common method of conducting hydrotherapy for stress or pain relief is with different water temperatures. There are therapies that focus on using cold water, hot water, or a combination of both. Cold water hydrotherapy helps increase the body’s blood circulation, which can be an instant relief for stress or pain. Cold water can also be a welcoming relief during the heat or throughout a difficult time in life. Some hydrotherapy experts recommend that patients try cold water showers to experience the benefits of the cool temperatures. Another hydrotherapy technique utilizes hot or warm water. Heat can be a powerful tool when combined with water therapy to help the body recover from a stressful situation or manage a chronic stressor. Heat can help the body’s muscles feel more relaxed or reset the body’s hormone levels. Some hydrotherapies use a combination of cold and hot water in sequence as a contrast therapy to help cleanse the body of stress and worry. Adding exercise to your daily schedule is another method of managing stress and feeling better. According to a study by NCBI, hydrotherapy can help improve the cardiovascular system and hypertension. Though it was once believed that hydrotherapy increased the risk of heart failure, research now shows cardiac function improves during aquatic therapy due to an increase in the amount of blood getting pumped to the heart. Deep Water Walking – Using water noodles, swim to the deep end of the pool and begin completing a walking or running motion. Aqua Aerobics – If you love dance aerobics, you can get a totally new workout by trying aqua aerobics. Most water aerobics classes take place in the shallow end and employ water weights for additional toning opportunities. Water Weight Workout – For this workout, you’ll need a set of specially designed water weights for the pool. Simply do regular reps of common free weight exercises to give your muscles some resistance training. Lap Swimming – Swimming is also an effective method of getting the heart rate up and exercising your stress away. When it comes to water and massage, an Italian study in the journal Minerva Cardioangiologica found hydromassage to be effective treatment for venous deficiencies due to the water’s hydrostatic pressure, thermal, and chemical properties. 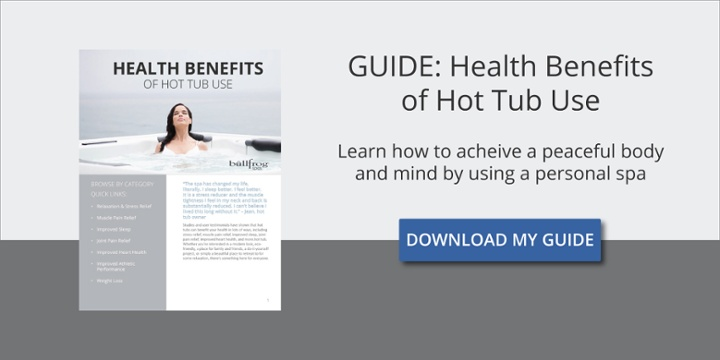 Jets in higher quality hot tubs are often positioned to reach the same pressure points typically used in reflexology and acupressure, mimicking the pulsation action and deep-kneading techniques used by trained masseuses to achieve stress and tension relief. If you live in an area with a facility that offers massage in the water, you may also have access to a heated therapeutic pool and therapist who works on your muscles under the water’s surface. While many hydrotherapy techniques involve immersion in a pool or spa, there are also methods of stress relief that use cold and hot compresses. Science explains that heat reduces stress by relaxing muscles and improving blood circulation while cold simply reduces the sensation of pain. Healthcare professionals have used hot and cold compresses to treat stress-induced ailments like migraines and sore muscles, in addition to a number of more general conditions including chronic dry eyes and kidney disease. Therapists and other providers make the compress by soaking a towel or other piece of cloth in heated or chilled water. The material is then applied to the desired area of the body to create a soothing effect. Some therapists are getting great results with their clients by using steam as a way to help achieve ultimate relaxation and reduce stress. According to the School of Medicine and Public Health at the University of Wisconsin-Madison, steam detoxifies the body and helps with muscle spasms, high blood pressure and seasonal affective disorder. The most common way to use steam for stress relief is in the form of a sauna or dedicated steam room. Sitting in a steam room can help cleanse the skin, open up the pores, and put someone into an ideal state of peace and rejuvenation. It’s also relatively simple to set up a steam room at home, by turning on a hot shower in a bathroom with the door closed. Plain water can provide plenty of therapy on its own, but you can realize additional benefits by incorporating minerals such as Epsom salt into your bath. Aromatherapy, which uses the body’s sense of smell, is a great way to get the combination of a relaxing bath and nature’s most beneficial minerals. Lavender oil is a popular choice for those interested in general stress relief. The pleasing smell and its chemical compound instantly offer a soothing sensation that can provide relief in a variety of stressful situations. Lemon is another good choice for a purifying mineral bath because it’s been linked to helping increase concentration and the body’s sense of calm. A Japanese study even found yuzu citrus oil to diminish anxiety and stress levels while also decreasing heart rates. For those who may be feeling a little down, many holistic practitioners consider jasmine oil a great additive to alleviate temporary sadness. When the oil combines with vapor from the warm bath, it can instantly impact the mind’s mood. German researchers even went so far as to declare jasmine to be as powerful a mood enhancer as valium. If you’re feeling tired or sluggish, add peppermint or cinnamon oils to your next late night soak for a quick boost of energy and focus. Regular sessions of hydrotherapy, either with a professional or in your own home, can help you conquer the daily stresses of being a responsible adult. Whether you choose steam, water exercise, cold showers or a hot tub, you can wash your stresses away each night if you look to water to be your source of stress relief. Being free of major stress can help you be the best version of yourself and reach that next level of happiness.